Iain founded the film company Anchovy Pictures (small fish in a big pond). 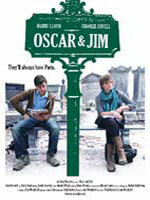 Sarah composed the score for their first film, Oscar & Jim, starring Harry Lloyd and Charlie Covell, which won Best Short at the Rhode Island International Film festival 2009. Our second film, a feature called Truth Beauty, was shot in the summer of 2010. Iain is also a playright and creative director.